Who the heck does not like yogurt? After all the possibilities for its use are endless! Yogurt is used in parfaits, smoothies, soups, pancakes, and can even pinch-hit for sour cream. Yogurt is rich in protein and calcium and also contains potassium which is important for ♥ health. Yogurt also contains live, active bacteria cultures. These active bacteria cultures are also known as probiotics and are great for maintaining a healthy gut and digestive system. However, with so many choices choosing the best yogurt can be challenging to say the least! Navigating the grocery store in search of the best yogurt can be tricky! I was in Shop Rite the other day and I kid you not – the yogurt aisle almost spans the entire length of the dairy aisle. I remember back in the day – the only two choices were Yoplait and Columbo straight up regular yogurt. There were no flips, dips or cherry pie-flavored yogurts. Just the normal variety of boring flavors like vanilla, peach and strawberry. Now a days there are SO many different options to choose from. Greek, traditional, flavored, plain, fruit filled, and varying percentages of fat are all factors to consider when buying yogurt. But what do these terms all mean? What is the best yogurt in light of all these choices? Let’s get to the bottom of this madness asap! What percentage fat should I buy? This question is tough. In all honesty – it depends on your #dietarygoals are as well as your overall health. If you have high cholesterol or are just trying to keep your calories on the low side then choose low-fat (1%) or fat-free (0%) yogurt. These two choices generally have the lowest calorie value and contain a nominal amount of saturated fat. Look for labels that have the lowest amount of saturated fat. However, if your cholesterol is not an issue and you are just looking for a yogurt with a thicker consistency then opt for a 2 % or full-fat yogurt. I personally prefer 2% or full-fat plain yogurt. My favorite traditional brands when I can find them (please don’t laugh 🙂 ) are YoBaby Whole Milk Plain Yogurt or Liberte Plain 2 % Yogurt. Shop Rite generally carries the YoBaby. But lately I can only find the plain Liberte yogurt at Whole Foods. The reason why I like these brands is # 1 (and most important) they taste pretty darn good ! And # 2 both brands contain under 10 grams of sugar. Also they have no added funky ingredients. Which is best: Greek or traditional ? Greek yogurt is strained which makes it thicker, creamier, and smoother than traditional yogurt. When comparing Greek and traditional yogurt, Greek yogurt has around double the protein but does have less calcium than traditional yogurt. 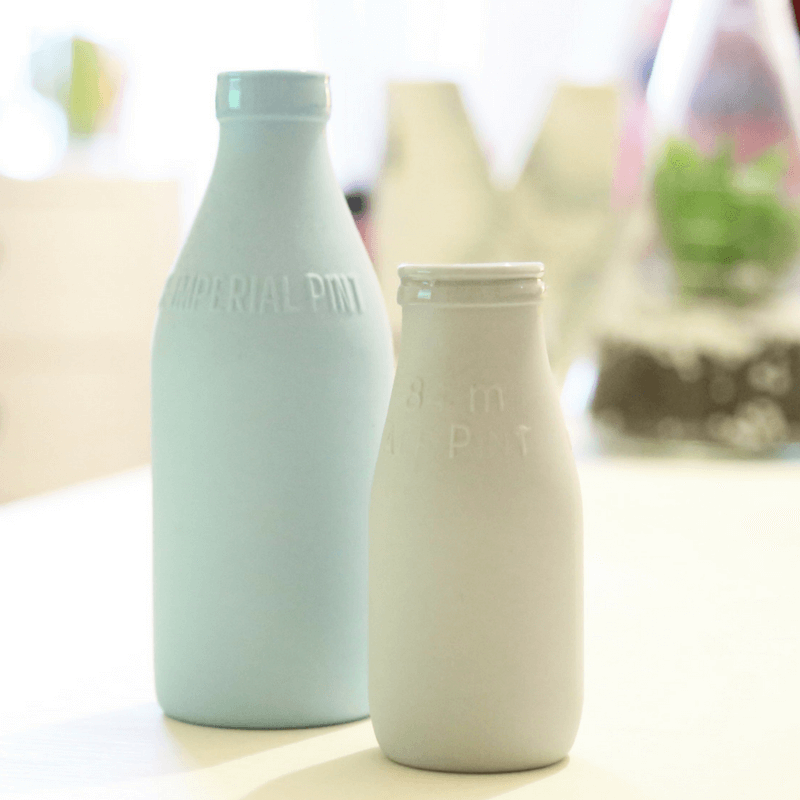 Both Greek and traditional yogurt are usually well tolerated by individuals with lactose intolerance. However, Greek yogurt has less lactose than traditional yogurt and may be even better tolerated than traditional yogurt. Most people prefer Greek yogurt to traditional yogurt because of the higher protein content. Nowadays pretty much every major brand has both a traditional yogurt and a Greek yogurt. Even Chobani who started out their career just selling Greek yogurt now has a “old-fashioned non-Greek traditional yogurt smooth yogurt”. Therefore, you can be brand loyal and still get your pick of the litter! However, please don’t fret if you just don’t love Greek yogurt! Many of my patients don’t like it and prefer the traditional style instead. Keep in mind – the average American consumes more than their daily requirement for protein. So if you opt for the non-Greek variety you will not be selling yourself short in meeting your protein needs. For the Greek yogurts I personally bounce around brand wise depending upon what is on sale and has the lowest amount of sugar per serving. I shop mostly at Trader Joe’s. But unfortunately (aside from their ‘plain’ Greek yogurt) they do not carry a whole bunch of options under 10 – 12 grams of sugar. Some of the Greek yogurt brands in my fridge now are Siggi’s Greek Yogurt – 2 % Black Cherry, Fage Greek Yogurt-2% plain and Chobani Plain Whole-Milk Greek Yogurt. Should I buy plain, flavored, or fruit filled yogurt? One of the major issues with yogurt is it often has added sugars. Yogurt is made from milk (duh!) and therefore has naturally occurring sugar in it, called lactose. Thus, if you look at the nutrition label of plain yogurt, you will notice it has 12 g of carbohydrates. Since this sugar is naturally occurring, it is not of concern. However, what is concerning is the large amount of added sugars in many yogurts. A serving of flavored yogurt can contain an upward of 30 grams of sugar depending on the brand. That is a wholelata sugar! A can of soda has about 24 grams of sugar so the comparison is clear. You can skip the added sugars by buying plain yogurt. Then you can be creative and add your own fruit and flavors such as cinnamon and vanilla. Hello fancy pants! You can even go nuts with different extracts such as almond, coconut or coconut to pump up the flavors without the calories or carbs. 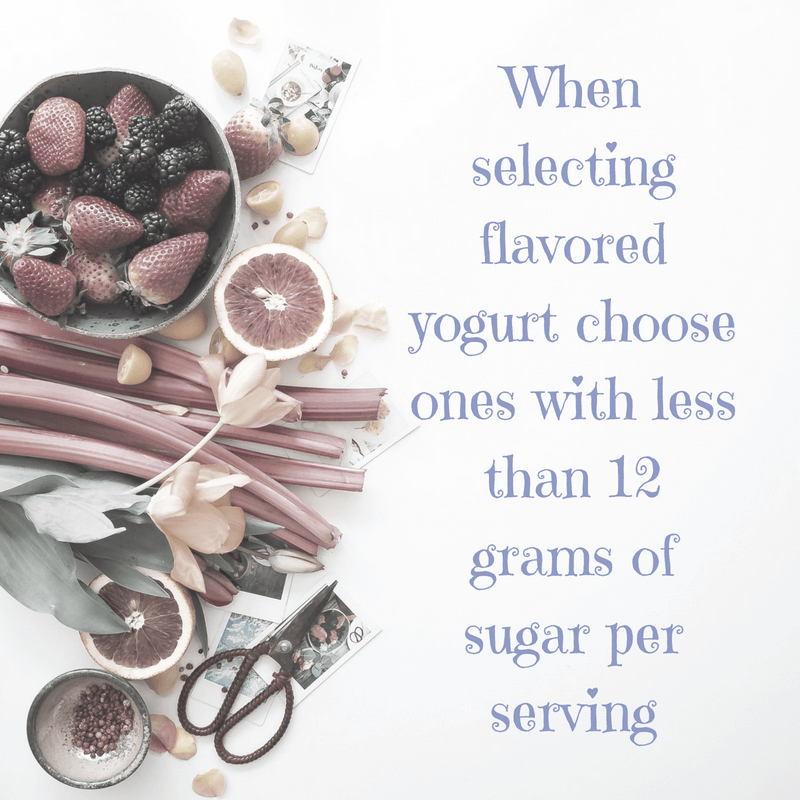 When you buy flavored yogurt, check the nutrition label and try to buy a yogurt containing less than 12 grams of sugar per serving. Some of the brands with the lowest amount of sugars include Dannon Oikos Triple Zero Yogurt, Chobani Hints, and Siggi’s Greek yogurt mentioned above. Navigating the yogurt aisle used to be challenging! But now, you should be able to navigate the dairy aisle with ease. 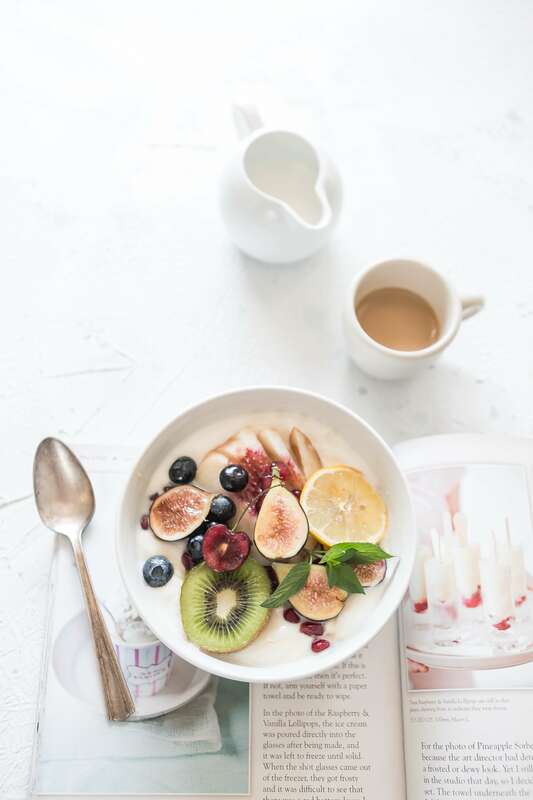 Opt for low sugar yogurts that fit your dietary goals, budget and taste palate. Selecting an appropriate yogurt should now be pretty easy! As always, if you have a question bring the nutrition label to your nutrition visit and the dietitian can review it. Enjoy your creamy, delicious yogurt! What is your absolute favorite yogurt on the market? Tell us what you think in the comments below.